Pigs under 10 lbs - 1 pump (1 ml) twice daily. 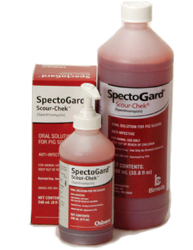 Each pump of the plunger delivers 1 ml of solution containing 50 mg of spectinomycin. Treatment may be continued twice daily for 3 too 5 days. If pigs do not improve within 48 hours, rediagnosis is suggested.